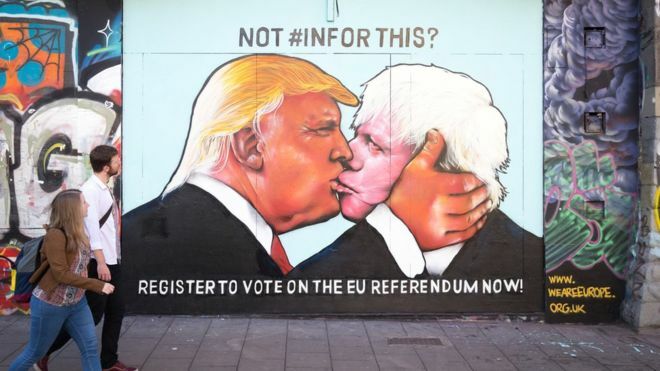 Donald Trump and Boris Johnson have been pictured in a passionate embrace in a 15ft-high artwork painted on to a building in Bristol. It portrays the US and UK politicians – who are united over desires for Britain to exit the EU – engaged in a kiss. The image is reminiscent of an iconic Berlin Wall artwork of a kiss between ex-Soviet leader Leonid Brezhnev and East Germany’s Eric Honecker. The area where it has appeared is regarded as Banksy’s “spiritual home”. The work is situated in The Carriageworks in Stokes Croft, part of a collection of buildings considered to be one of the city’s biggest eyesores. Campaign group We Are Europe said it was behind the artwork. Felix Braun, one of the artists, said painting it “surreal and brilliant” as it provoked “so much laughter and strong opinions” from passers-by. “People were beeping their horns, stopping their cars to take pictures out of the window, shouting their approval, coming up and shaking our hands,” said Mr Braun. Text below the painting suggests that voters who are against the pro-Brexit stance of Mr Trump and Mr Johnson should register to vote in next month’s referendum. Mr Johnson, former London mayor, is leading a campaign for Britain to leave the EU. US presidential hopeful Mr Trump has said that the UK would be “better off without” the European Union, and blamed the EU for the migration crisis. The Bristol painting is similar to the picture My God, Help Me to Survive This Deadly Love, sometimes referred to as the Fraternal Kiss, a 1990 graffiti painting on the Berlin Wall by Dmitri Vrubel. It depicts Brezhnev and Honecker in a fraternal embrace, reproducing a photograph that captured the moment in 1979 during the 30th anniversary celebration of the foundation of the German Democratic Republic.